Given that 70% of working-aged adults who are blind are unemployed, Lighthouse for the Blind of Fort Worth is committed to offering competitive and meaningful employment for adults who are blind or have significant low vision. The Lighthouse is the number one Tarrant County employer of individuals who are blind or have significant low vision. This commitment is the reason for our existence and we have remained true to this aspect of our mission since 1935. When Mrs. Willie Fay Lewis started Lighthouse for the Blind of Fort Worth, it was about jobs for the blind. The production of mops, brooms and other household items by Lighthouse employees provided the revenue stream to keep the doors open; in the mid-seventies, light manufacturing of paper products, shipping containers, and military supplies bringing about a significant change in attitude as to the abilities and skills of workers who are blind. Today we carry on Willie Fay’s legacy of providing jobs for the blind community, but we know that it is more than just providing a job! 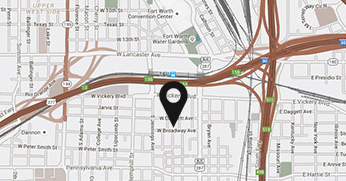 We operate an 80,000 square foot facility just south of downtown Fort Worth. Our talented workforce manufactures and/or packages a variety of products that include fast pack shipping containers, spiral wound tubes, tubal packaging, copy paper, drug test kits, and an optical lab. With proper training and reasonable accommodations our employees form quality, competitive work force that can do anything that a sighted work force can do. That is incentive enough for our senior management and board of directors to “think outside of the box” and offer new training and job opportunities for people who are blind. We invite you to observe our mission in action by coming for a tour. To schedule, please contact Rebecca Smith at rsmith@lighthousefw.org or by calling 817-332-3341. How was it navigating our site? Copyright © 2019 Lighthouse for the Blind of Fort Worth. | All rights reserved.